Facebook has today announced the launch of a new ‘Marketplace’ within its main app, in an effort to offer a convenient destination to discover, buy and sell items with people in your local community. The company said that buying and selling in Facebook Groups has grown substantially, with over 450 million people visiting such groups every month. “Marketplace makes it easy to find new things you’ll love, and find a new home for the things you’re ready to part with”. The new Marketplace is accessible from within the main Facebook app. Simply tap on the shop icon at the bottom of the Facebook app and start exploring. Marketplace opens with photos of items that people near you have listed for sale. To find something specific, search at the top and filter your results by location, category or price. You can also browse what’s available in a variety of categories. Once decided that you want an item, you can send the seller a direct message to tell them you’re interested and make an offer. Selling an item in Marketplace is just as easy. 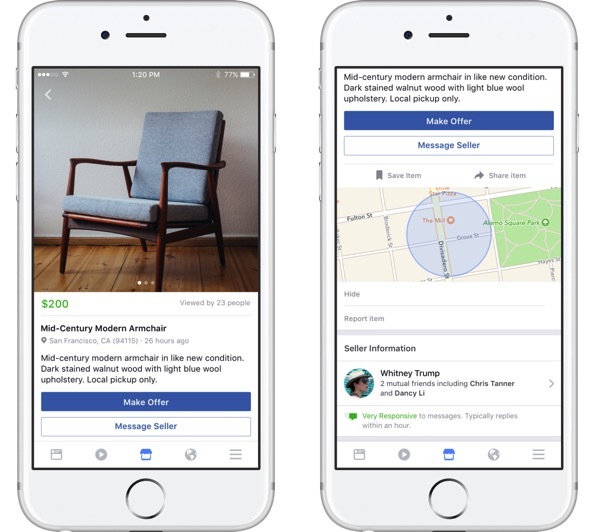 Facebook Marketplace is rolling out on iOS today in the U.S., U.K., Australia and New Zealand.